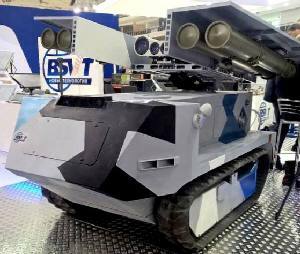 Self-propelled robotised anti-tank missile system Bogomol is designed for twenty-four-hour destruction of fortified ground targets, tanks, armoured vehicles and hovered helicopters in automated mode. For the first time it presented at the exhibition MILEX 2017. 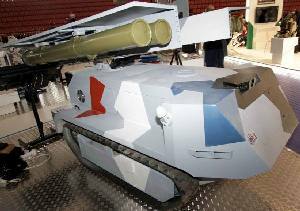 SPATMS Bogomol is based on self-propelled remotely controlled tracked mini-chassis able to move on a cross-country terrain. 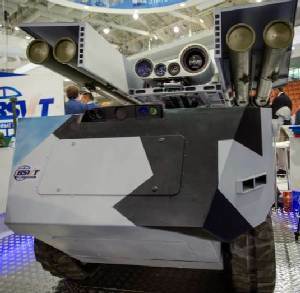 SPATMS Bogomol comprises self-propelled robotised combat vehicle and automated work station for operator wireless controlling robotised combat vehicle at the distance up to 300 m. The control unit is equipped with a screen and controls. After the operation of the SPATMS Bogomol automatically moves to a new firing position. The vehicle was designed in two variants - export, and designed for the Belarusian army. The difference is mainly in the integrated weapons. It is possible to use anti-tank systems of different types, manufactured by various foreign enterprises. SPATMS Bogomol powered by hybrid power pack. It is a diesel engine with an electric generator. The driving wheels is carried out with the electric motors, which receives power from the batteries. If necessary, the vehicle can move for a while with the diesel engine turned off, which reduces the acoustic and infra-red signature. The vehicle is tracked, with several small-diameter base rollers, guide and driving wheels, and also with one supporting roller. All the main parts of the running gear are protected by a metal shield. The track is rubberised. There are four rocket launchers equipped with a fire control and guidance system. Elevation drive is hydraulic. Optical-electronic surveillance, search for targets and guidance devices are located in the middle between the launchers. SPATMS Bogomol is compatible with anti-tank complexes of various types. At the customer request, the complex can be equipped with 9K111 Fagot, 9K115 Metis, 9K111-1 Konkurs or Shershen systems. The range of fire and armour penetration depends from the rocket used. Remote control of the vehicle can be by radio channel, wires or laser beam. 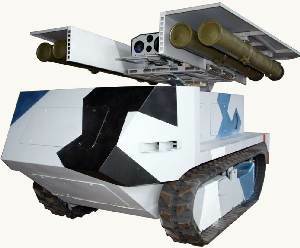 The robot can independently use rocket armament, when it reach the specified start-up line. There is also an additional unit with five lenses mounted on the body, for monitoring the terrain and driving. 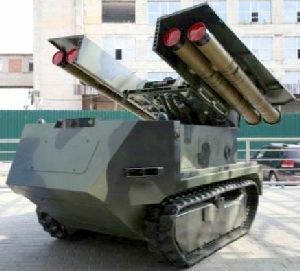 The total height of the vehicle in combat mode is not more than 1.7 m, weight with an ammunition and fuel reserve is 800 kg. Road range - up to 100 km without refuelling. On the rough terrain the speed of movement is 5 km/h.